Palaeolithic, paleolithic (Greek: palaios-old and lithos-stone) or Old Stone Age was period that fully coincide with Pleistocene Epoch. For this period were related first cultural paleolithic groups, movement and spread of cultural groups, as well as their influence and disappearance. In general, the cultures of the Old Stone Age are usually in the archaeological science, named after the place where it was first discovered or where the most characteristic site was. Therefore, names of some cultures such as Oldowan, Abbevillian culture etc. are characterized by the various periods in which dominated handicrafts that were typical for the culture of a certain type. Old Stone Age starts from about 2.5 milion years BP (before present) and it lasted all the way to 10.150 BP when Holocene geological epoch came to the scene. Holocene epoch lasts to this day. Paleolithic period can also be divided into several smaller timeline periods, three of which are fundamental: First period is the Old or Lower Paleolithic, which almost completely coincides with Paleo-Pleistocene epoch. Cultures, which are part of this epoch, are: Oldowan culture. 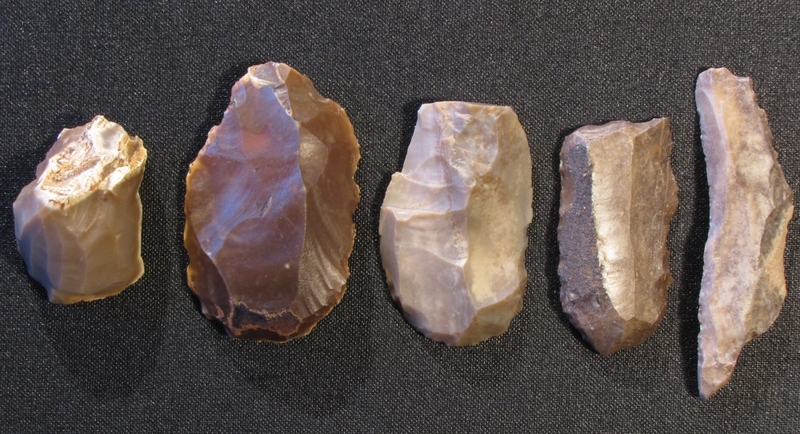 The second period is the Middle Palaeolithic. It dates from the 800.000 BP, all the way to 30.000 BP. Paleolithic is characterized with the production of tools and weapons by hewing or carving. Such tools were rough and imperfect. These tools carry a strong mark of its great age and human primitiveness. First tools, and weapons, were made out of stone and with a lot of effort. He did that in order to ease life in the wild. A man, with its physical characteristics could hardly resist powerful enemies of the nature. In the Paleolithic era, man in its nutrition used a variety of plants and animal meat. He daily collected edible roots, various herbal fruits, mushrooms, insects, honey, and variety of small animals and so on. A collecting economy has been present throughout an entire Old Stone Age. Parallel with this economy, was developed hunting skills on big herds. Entire human communities depended on the successful hunting. Therefore, all Paleolithic cultures of people were imbued with the hunting way of life and thinking. Most the tools of the time were used for hunting, animal skin peeling and cutting of the animal meat. In the beginning, people made stone spikes, and only later, particularly in the Upper Palaeolithic, they started to make significant progress in their hunting techniques. That is how they made first arches, and after that they also special throwers, which gave to the spears particular speed, and penetration as well. Paleolithic people most often used so-called chase hunt that at the time of the Lower and Middle Paleolithic was poorly represented and organized. However, later, such hunting technique has come to the fore in terms of its presence and organization. Namely, chase hunters forced animals into the mud and the straits, where they had no way out, and then they would chase them towards steep ravines where animals would fall and broke legs. They also dug holes on the tracks, which animals used in order to drink water or go on pasture. These holes were very well hidden so animals could not see them. That is how Paleolithic people by using trickery instead of offensive weapons, came to the necessary food. 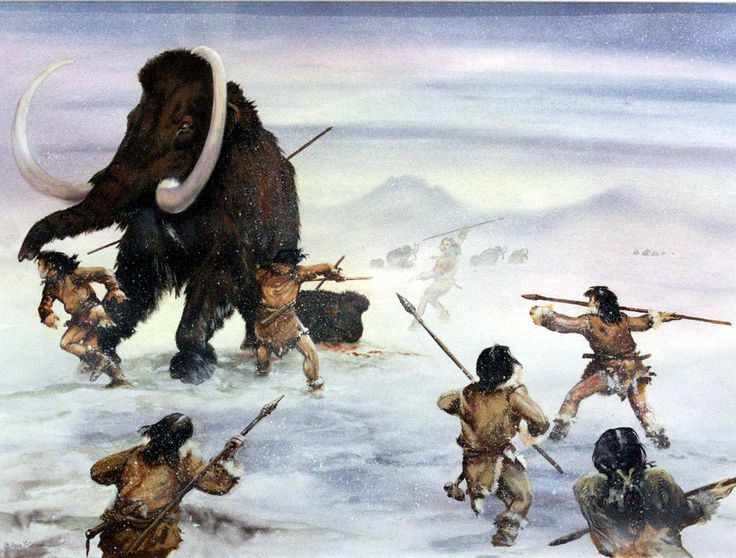 However, such hunting strategy was very dangerous and it required a lot of prudence, skill and courage because many animals were faster and stronger than man was. Paleolithic people hunted all types of animals that lived around them. By hunting, beside meat, they secured themselves with fat, bones, hair, horns and skin, thus everything that was of great importance in their fight for life. Especially valuable catch were large herbivores such as elephants, mammoths, deer and reindeer. On such occasions, the whole horde could despite the great feast, leave pieces of the meat as a food supply for the coming days. Hunting of the herd animals was not always successful. This type of hunting was more depended on circumstances, than on the available weapons. Therefore, in the life of paleolithic people, there were periods of fasting, which resulted in the appearance of cannibalism, which was particularly developed in Sinanthropus and Neanderthals. It is interesting that the first victims of this act were children, then people whose growth was bent, and patients who were not able to defend themselves. Frequent starvation’s led to a high mortality rate, especially among women. Many members of the Neanderthal species died at the age of 20, and there were rare cases of people who reached the border of 40 years of age. 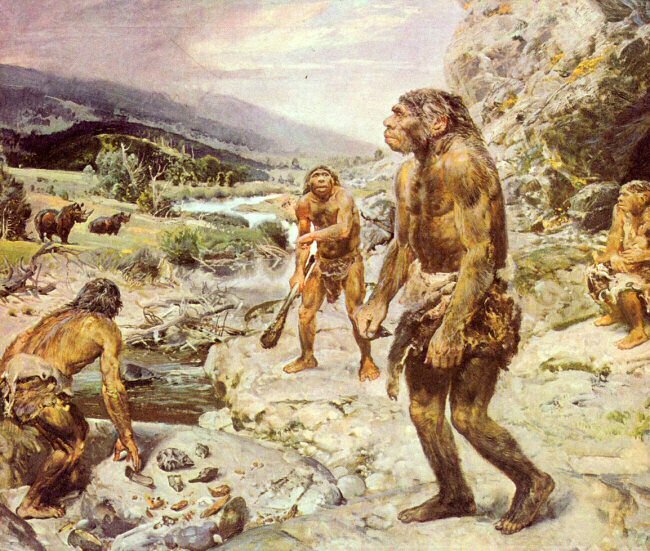 In addition to hunting, paleolithic people were engaged in fishing. The fishes were probably killed with harpoons, which were made of bones, and sometimes they hunted with stone hooks. Archaeological science firmly believes that people all the way to the Upper Palaeolithic used food in the raw state, in a state in which they came across in nature. However, with better understanding of the fire and its characteristics, people began to fry meat, but at the beginning, they did not cook food because they did not have adequate dishes. Finding the fire was of great importance. The man had started to use fire more in Acheulean period, but only as a gift of nature, i.e. product of volcanic eruptions, lightning or a big wildfire. Much later, paleolithic people succeed to make fire by friction between two wooden surfaces, or by making sparks using flint. Special care of each tribe was to keep the fire going because the skill of making fire was not available to anyone. That is why in some tribes there were people whose main concern and task was to maintain fire. Fireplace was the name of the place where the fire was made and maintained. Fireplace was not only used for food preparation and heating of the frostbite body parts but also for intimidation and scaring away wild animals that from a far lurked and tried to participate in the feast. Skilled craftsmen were making different tools and weapons near the fire. Near the fire was also a place where hunters prepared themselves for the hunt. Fireplace very quickly became a place, which everyone loved. The fire from the fireplace illuminated the interior of the caves or shelters. Therefore, an entire family lifetime took place near the fireplace. An paleolithic humans did not feel any need for permanent residence, nor for clothing. At night, they would flee before the beasts, usually in trees or in the thick branches of the trees, while against wind they used natural shelters. However, with time, descendants of paleolithic people started gradually but steadily to conquer and inhabited caves. Since then, people started more and more to appreciate cave, especially during the period of glaciers occurrence and spread of glaciers. 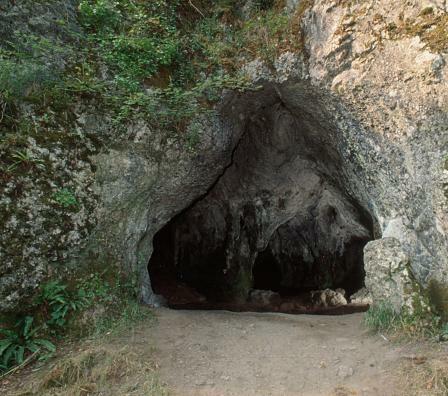 In the Upper Paleolithic, caves became very popular places for residence. In the areas where there were not any caves, paleolithic people lived under the open sky and they had to endure a harsh climate. That is why an paleolithic people had an idea to build above ground shelters in the shape of cribs. They also started to make clothes out of animal’s skin. The oldest settlements and tools of work were found in southern Europe, then in Russia, and Southeast Asia, and in Africa. Paleolithic hunters very cleverly choose places of residence, confirming, in that way, that they were excellent experts in nature. They built shelters near the water, where animals would come to drink water. Near the water, it is the easiest place to attack and catch prey. A selection of permanent residence depended, in the first place, of this fact. The earliest settlements did not have partitions or doors and no windows. As the material for construction of these shelters paleolithic people used wood, branches, sticks, bark, leaves, straw, reeds, animal bones, skin, fur, stones, grass, clay and later mud bricks (initially dried, and later baked). The opening for the smoke, which at the same time was a source of light, paleolithic people left at the upper part of the cabin. Necessary supplies as well as accessories for the house was made of wood, branches, birch bark, mouths, bamboo, gourds, clay, leather, etc. Products for food were stored in special wicker containers, which were pasted with clay. The food was prepared in wooden troughs using hot stones. An earliest cooking of food was possible only when the pottery was discovered. As cutlery, paleolithic people used various cups, bowls, spoons, knives and sticks. For grinding of grains, they made stone millstones and wooden poles. First outfit was quite diverse. The oldest outfits are apron, belt, rope, skirt, while clothes with sleeves and pants appeared much later. Depending on climatic conditions, people have made clothes out of leaves, leather, vegetable fibers, hair, and they sewed clothes with needles made of bones. A little later, footwear was also made out of tree bark, leather, wool, etc. Building of the settlements, and then making clothes, shoes and household utensils directly affected the development, of trade and development of tools for processing wood, bark, processing of animal skin, and so on. The earliest means of transport were boats, then the sleds and skis, and later carts with wheels, which were made back in the Bronze Age.